Oh look, another 1176 emulation! But I have 30 of them INCLUDING the FG-116 already in the Virtual Mix Rack. Why do I need another one? Why should I shell out $200.00 for something I already have? First off calm down! I’m just a news site. Let’s tackle these questions one at a time because when I got the press release, each of these questions popped in my head. I’m going to take a slightly different approach to this review. Instead of spending time analyzing each aspect of this plugin, then writing, I’m going to review it in print, as I’m working with the plugin. A sort of “live review” if you will. The FG-116 BLUE Series compressors are modules that work within Slate’s Virtual Mix Rack (Review HERE) and come in two main iterations: Vintage and Modern. Each Vintage version is based off of 2 REV A 1176s – one is a completely original model (circuit 1) while the other unit was refurbished in a way that altered the overall tone (circuit 2). For the Modern version, who knows what was used. I’m sure these models are still loosely based on the original hardware version used in the Vintage model, but Slate decided step outside of the box and create his “ideal” 1176 models. Essentially, the FG-116 BLUE Series contains 4 separate compressors and preamps. The preamp feature is a plus that incorporates the modeled analog circuit by “Shift Clicking” the attack button. This disables compression and allows for the coloration to be used exclusively as an effect. Some of the questions at the beginning of this review are slowly being answered right? Yes, we know looks mean nothing to a mix, but the interfaces on these models are some of the best looking Slate digital has designed yet. Friends who know nothing about pro audio walk up behind the desk and immediately mention how detailed and sleek these models look. They definitely attract attention and still feature the “random virtual wear and tear per instance”. Try it… Open up 2 Vintage modules and look at how different the scratch marks and wear patterns are for both models. It’s the small things… Each model features the typical 1176 style settings complete with gain reduction meter, input, output, ratio button, attack and release. Slate added several of the custom controls found in other VMR modules with 2 virtual “circuits” to select from, a high pass filter sidechain, and a mix knob to control how much compression is being blended with the signal. Both models feature the exact same controls, but with different colors on the GUI. The Vintage model has been meticulously modeled after two different models of “Blue Stripe” REV A 1176 models. These are selected via the circuit button. Circuit 1 has the standard mid-range centric push that places tracks out front in a mix while solidifying the low mids. This model is built for adding weight and presence to vocal track that won’t sit properly in a mix. Circuit 2 is based on the refurbished model and responds to audio quite differently. This model has more of a “smile EQ” effect with lush lows, tamed mids, and silky highs. Perfect for instruments who need to be heard, but featured. These two models are the most interesting by far. Both Modern versions feature slower attack times than the typical “fast” and “faster” times on the original units. The output sections have pretty much no transformer saturation, making these models much more clean than the Vintage circuits. These units are made to do exactly what you want an 1176 to do but with a surgical transient approach in mind. Circuit 1 is similar to the same circuit on the Vintage model but with more snap in the high end. The slower attack allows for more transient material to sneak through before getting squashed. Circuit 2 has the same characteristics as the Vintage circuit 2, but with a punchier low end and a slight more push in the high end. This model is made to be the most versatile of the models and can be used on material that an 1176 usually doesn’t fare well on, like a mix buss. Let’s revisit the questions we all had at the beginning. Question 1: Why do I need another 1176 plugin? Answer: Truth is you don’t. Pretty much any 1176 emulation you have in your arsenal up until this point is obsolete. You only need this one. I’m not overhyping when I say you can uninstall any other emulation of an 1176 and you wouldn’t miss any of them. Slate has not made 4 versions that sound even remotely similar to each other. These models all have drastic, audible differences. Each model contains a personality all its own. I used each model on the same content, with the same settings for the very same friends that do not know anything about mixing and liked the interface and even they could tell a difference between Vintage and Modern. They did have a little more trouble trouble between the individual model’s circuits but that’s to be expected with untrained ears. The difference to the trained ear is still noticeable. If presence is needed, Circuit 1 – if glue is needed, Circuit 2. Question 2: Why should I shell out $200.00 for something I already have? Answer: Again, you don’t have to. At the time of this review, Slate Digital offers access to all plugins with the “Everything Bundle” for either $24.99 a month or $274.00 for a year. 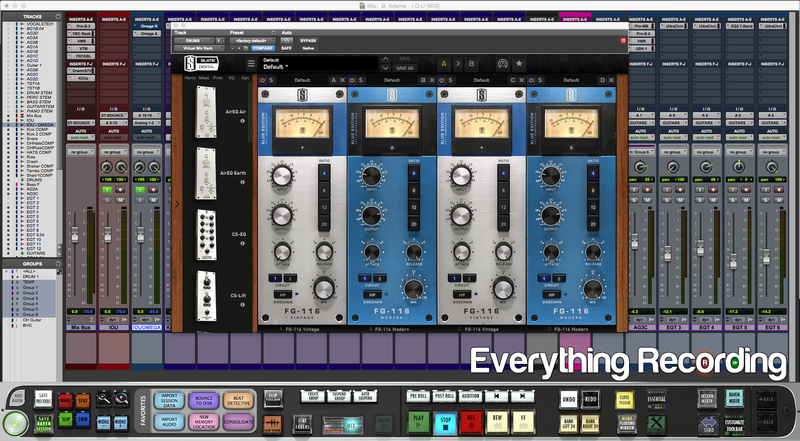 That is not only access to the FG-76 BLUE Series, but every single plugin they offer. Even if you want to own them outright, $199 ($149 at time of review) is a steal. Go on over the Waves and see how much the CLA76 is. That’s $250 for only 2 versions. BLUE Series has 4 different compressors. That very same $250 has you well on your way to a year of every Slate plugin that exists and will exist in the future. I’d say the value for money is heavily in BLUE’s favor. These plugins are the perfect balance of what you love about an 1176 and what you want in an 1176. The mix knob makes dialing in just the right amount of compression quick and simple. These plugins are a match made in heaven for drums. I would put the Modern circuit 1 on drum busses and would bypass and immediately feel like a whole other set of drums were being played. Vocals thrive on Vintage circuit 1 and just try putting Modern 2 on your mix buss with about 25% blend. Thank me later. I even would just use the Vintage circuits without compression on electric guitar tracks for added weight. I could go on about all the uses. Look, I’ll be completely honest. I snicker from time to time at Slate’s videos for these plugins. I think we all display a slight virtual eye roll when they come on, but the product stands up to all of the hype. He knows how to make plugins and prices them within anyone’s reach. I wanted to have something remotely negative to say about these plugins but couldn’t. I really don’t want to sound like I’m overhyping or some sort of Fan boy but I’m not going to go out of my way to try to appear cynical. My only requests are that an external sidechain could be used in VMR as well as an auto release feature. I would also like an “All Buttons In” mode but word on the street is that Slate is designing “Monster”, a plugin that will do this and more, and it will be FREE. As with all things Slate, don’t believe me? Go get a trial. For the price, you won’t get a better emulation of the Holy Grail of 1176s – let alone a modern tweaked out version.